A gaggle of eight Boeing P-12Bs, each flown by a 43rd Pursuit Squadron Instructor from Kelly Field in 1932. This formation of P-12s, from the 43rd Pursuit Squadron at Kelly Field, Texas, shows the entire instructor faculty teaching student pilots basic fighter maneuvers in the Air Corps in the summer of 1932. 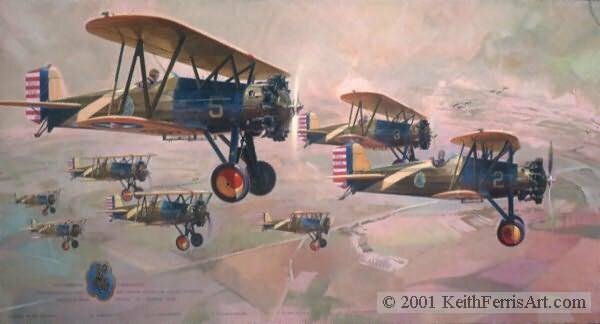 Flying P-12 #2, in the lead position, was instructor pilot and Commandant of Cadets, Lieutenant Carlisle I. Ferris, the artist's father.